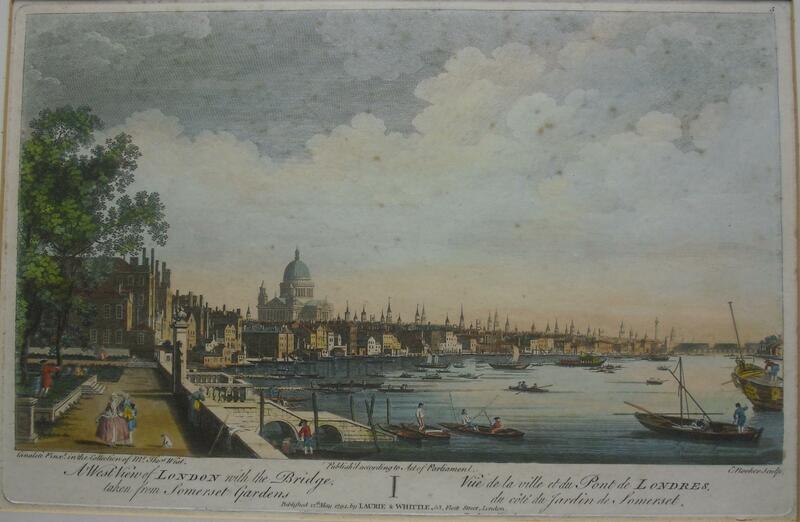 viaLibri ~ The West View of London with the Bridge taken from Somerset Gardens', View towards St Paul's, with buildings and churches, figures walking in gardens, boats on river, after Canaletto by Edward Rooker [1724-1774]. The West View of London with the Bridge taken from Somerset Gardens', View towards St Paul's, with buildings and churches, figures walking in gardens, boats on river, after Canaletto by Edward Rooker [1724-1774]. Laurie & Whittle 53 Fleet Street 12 May 10.25in x 16in 1794 - Engraving, with hand-colouring, title also in French, numbered 5, The original painting had belonged to Thomas West. This print was first published in 1750.